Welcome to Brittani Persha Counseling Office! Our office is located at 14760 Memorial Dr., Ste. 107 Houston, TX 77079. We are on the first floor of the 2 story office complex on Memorial Dr. imbetween Dairy Ashford Rd. and Eldridge Dr. Our Houston, TX child and family therapy office is conveniently located in the Energy Corridor. Our location is convenient for families located in both the Katy and Houston areas. We have designed our waiting room to be comfortable space for both children and adults. Our vision is that you are able to unwind and relax before your session begins. When you arrive at the office feel free make yourself something to drink. We have a variety of options available for you. Also, we have an array of reading materials in the adult waiting area. Please browse any that perk your interest. In the children's waiting area, you will notice a variety of toys, both on the table and on the adjacent bookshelf. There are also a children's books hanging in the book racks. Your children are welcome to play with any toys and books they desire. You will also notice a clip board with copies of Parent Weekly Checkin Report on the wall in the children's area. Please feel free to fill one out for your therapist prior to session. Depending on the child's needs, we may not be able to check in with each parent privately prior to each session. Your therapist will come out to the waiting room to bring you back at your assigned appointment time. Please remain in the waiting area until your therapist comes out to get you, as there will be other sessions progress. 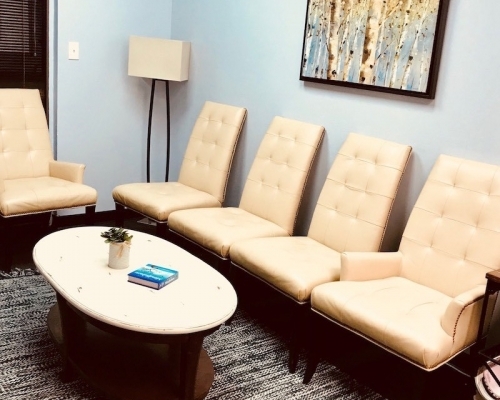 Counseling sessions are held by appointment only Monday – Sunday availability. Available times differ depending on day and by therapist schedule. In general, we offer sessions Monday-Friday from 8:00 a.m. -7:00 p.m. Weekend appointment availability varies. Please contact us for more information. We have designed each of our offices to be a safe and comfortable place for both adult and children. Each office includes a diffuser where we use a blend of essential oils aimed a providing a calming atmosphere. All offices also have an array of fidget toys and a variety of sensory elements to meet individual client needs. Each office has a designated play area that is fully equipped with all the toys needed to provide play therapy services. Feel free to browse the images below to get a better idea of our offices.